If you love extravagant, over-the-top desserts and delicious food, then this is the place for you! 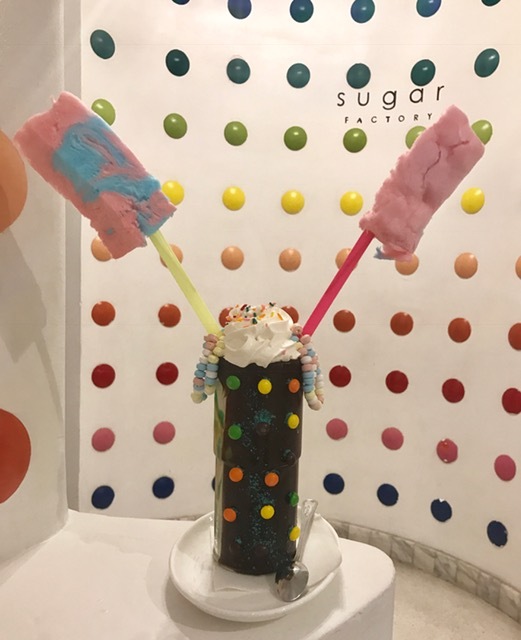 The Sugar Factory has locations all over the United States and even some internationally, but only certain cities have the retail store and restaurant combined. 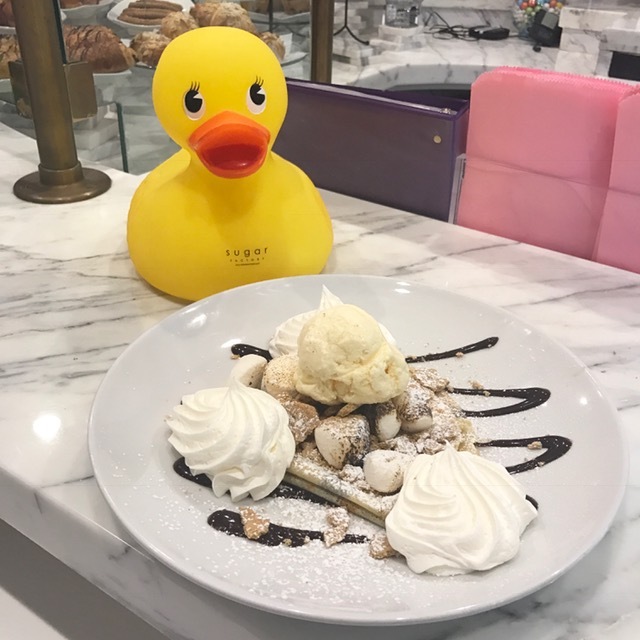 A few of the exclusive locations where you can try their full dining experience are in New York City, Chicago, Las Vegas, Miami Beach and Dubai Citywalk. I knew I had to stop by the Ocean Drive location while in Miami Beach last month and they did not disappoint! My best friend and I were greeted immediately by the manager, where he then led us to our table on the outdoor patio. Within moments, our amazing hostess arrived with a martini glass full of assorted candies (The chocolate gummies are my favorite!!). *Not only is the restaurant right on the beach, they had marble tables too! Can you say a bloggers dream?! Shortly after they brought the candy, we saw them walking over to our table again with four of their most popular drinks! 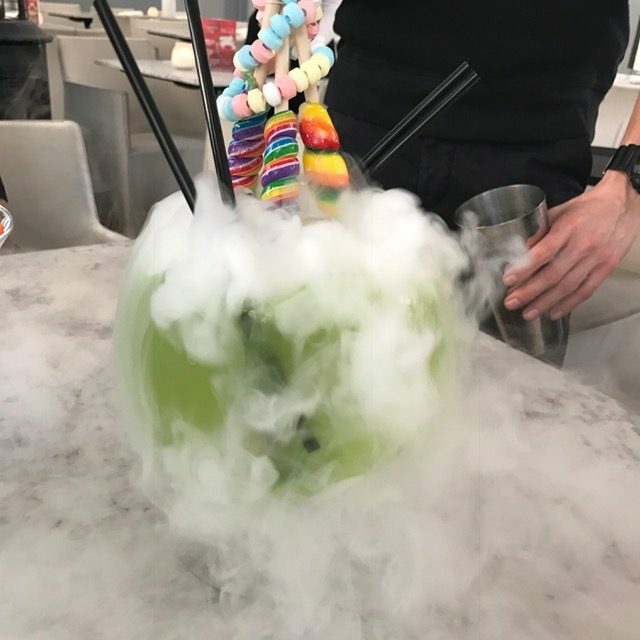 Their goblet drinks are what attracted me to the Sugar Factory in the first place so I was super excited to see not one, but TWO goblets headed our way! The first goblet they poured was the “Lollipop Passion”. 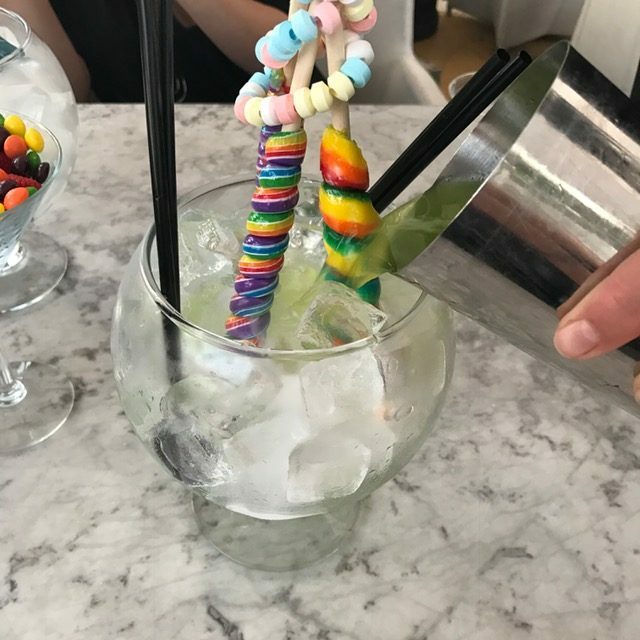 This 60 oz drink has a mix of melon, coconut and pineapple, with candy necklaces and lollipops. 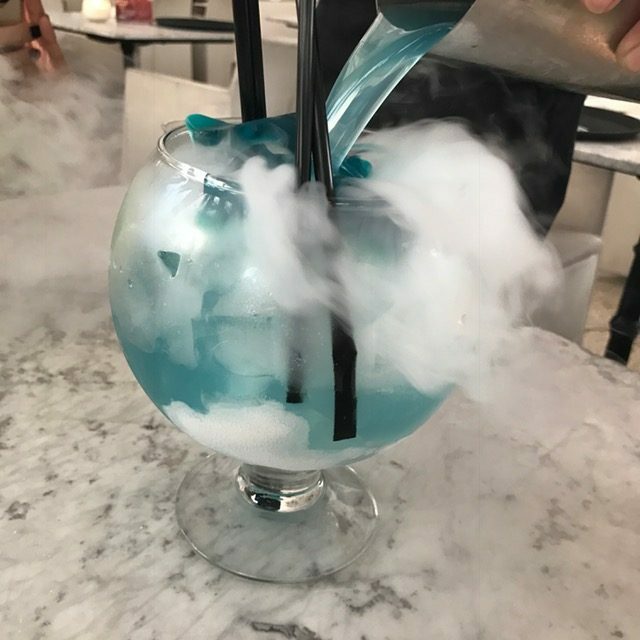 The next goblet was called the “Ocean Blue”. 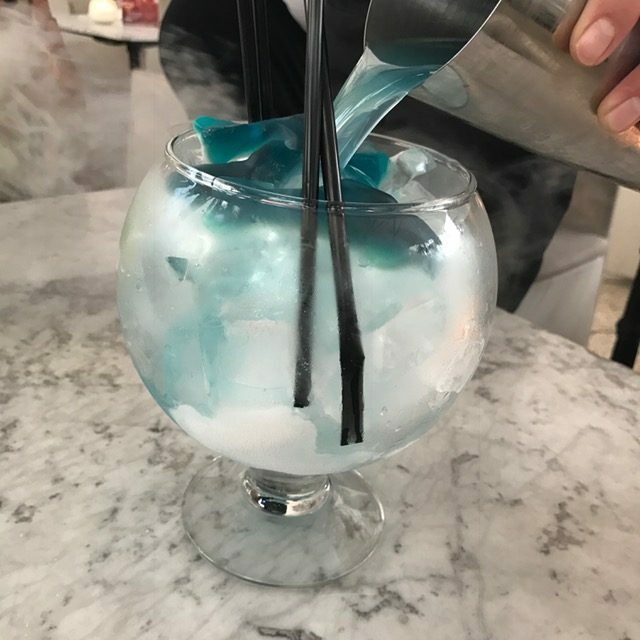 This cocktail had shark gummies mixed in with Hpnotiq! This drink was absolutely DELICIOUS and definitely a favorite of mine! Next up were the martinis! The “Sour Apple Lolly” is SO GOOD!! 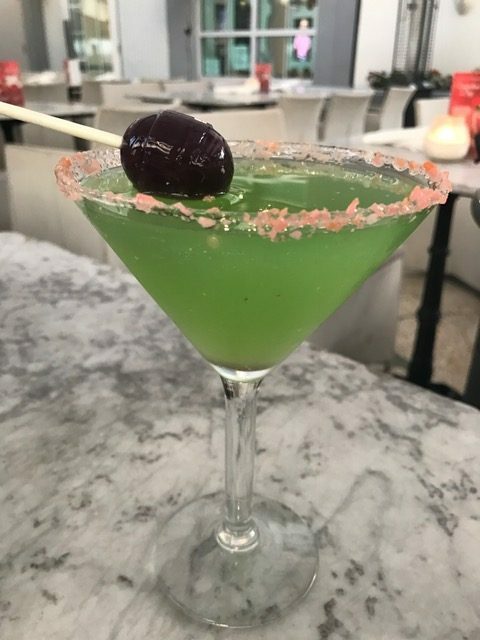 It was another favorite of mine with bubble gum pop rocks lining the rim and a sour apple lollipop in it! I am a huge fan of sweet fruity drinks so if you’re like me, try this one! 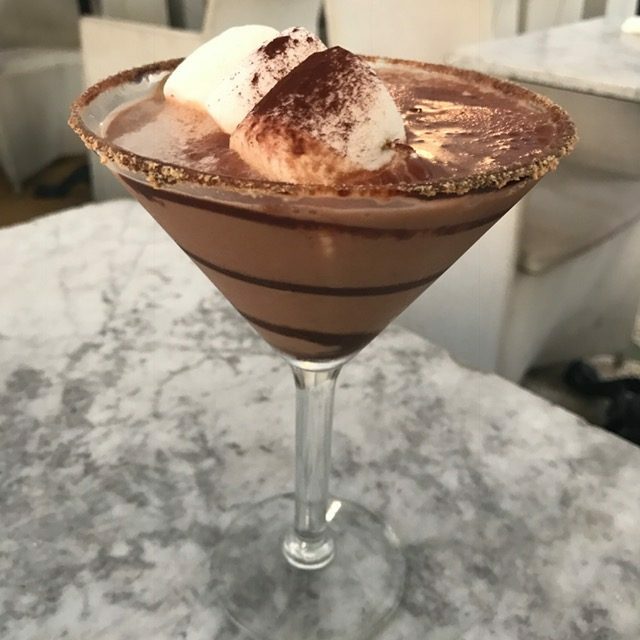 The “S’mores” chocolate martini below tasted just like s’mores and was warm almost like hot cocoa! This is for my avid chocolate lovers out there! After trying all the drinks, it was time to get some food in our stomachs! 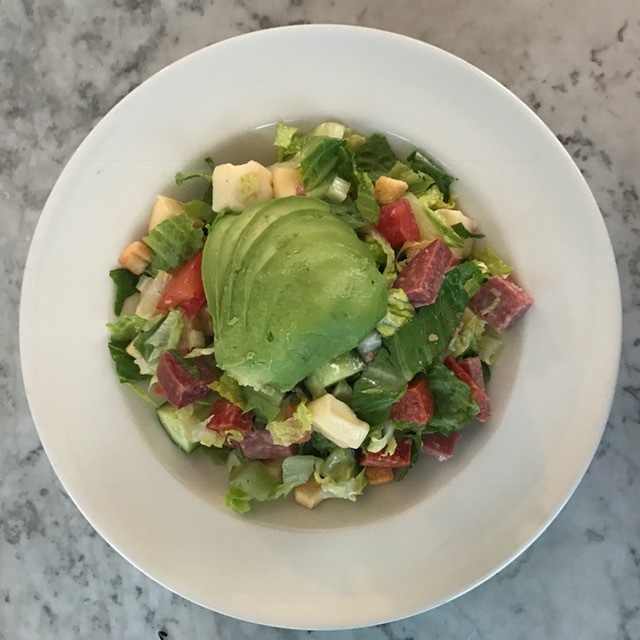 The first entree they brought out was the “Garbage Salad”, which has romaine lettuce, tomatoes, cucumbers, avocado, salami, pepperoni, mozzarella, provolone and croutons with lemon herb vinaigrette. It was so refreshing and definitely my best friend’s favorite (she’s a huge salad fanatic, so that says a lot). It was the next entree that caught my eye though! “The Big Cheesy”. Can you guess what this was? 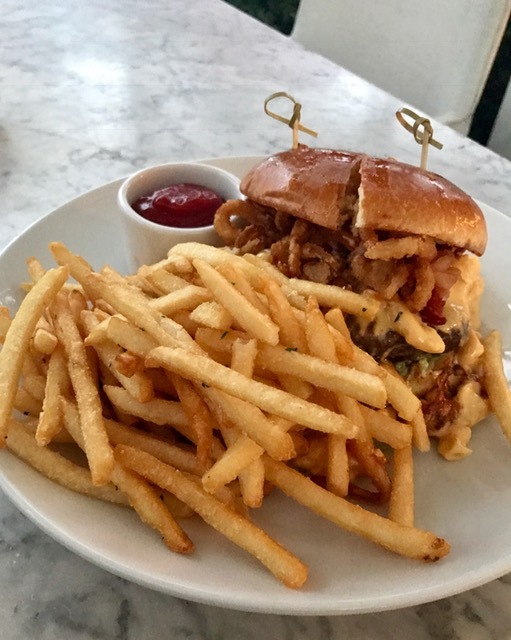 This ginormous grass fed Angus beef burger was topped with macaroni and cheese and smoked apple wood bacon all on a warm, toasted brioche bun. I am a huge burger fan and have been since I can remember, so the thought of trying a burger with mac and cheese warmed my heart! And to no surprise, it was nothing short of amazing! The entrees just kept coming! 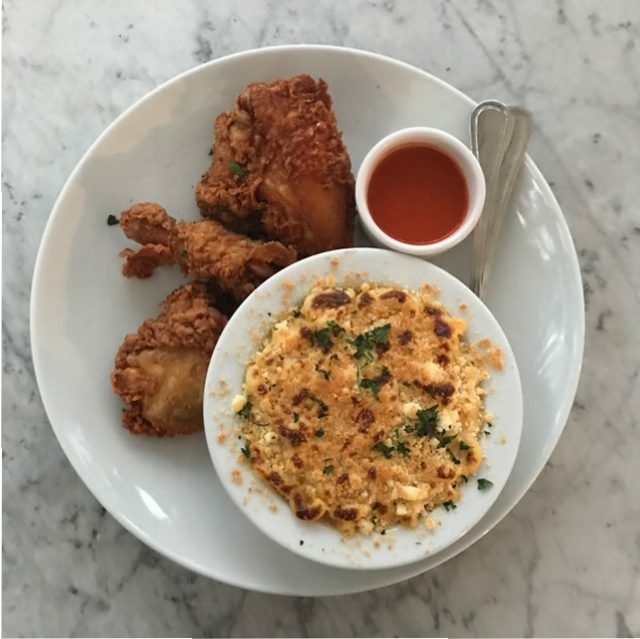 But what would a meal be without some fried chicken?! Next up was the “Country Fried Chicken”. This meal had macaroni on the side with some blazing buffalo sauce. It was perfectly cooked and I had no complaints! We were in shock when they came back to our table to tell us they would be bringing out desserts at this point. How could we possibly fit anything else in our stomachs?? 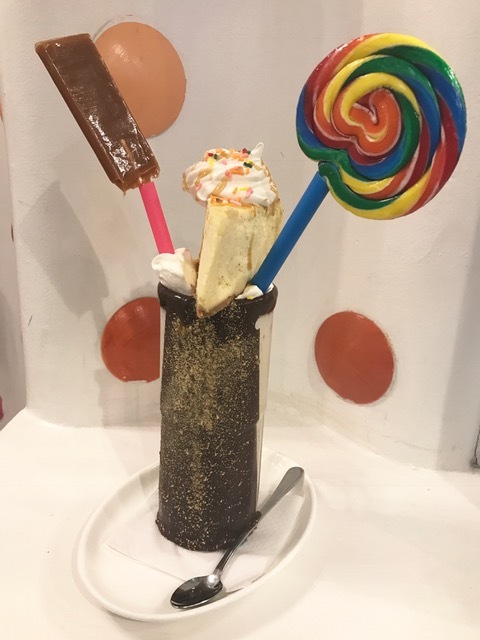 … but somehow we found a way 😉 I mean with a milkshake that has cheesecake on top, with two lollipops how could you resist? The “Caramel Sugar Daddy Cheesecake” was a vision! To a big sugar fanatic such as myself, even I couldn’t have imagined a treat like this in my wildest dreams! Believe it or not, not only did they bring out that milkshake, they brought out the “Tie Dye Milkshake” too. This milkshake was out of control!!! I LOVE cotton candy so I started there, but not before putting on my candy necklaces (you have to accessorize after all). This vanilla milkshake had red, blue, green and yellow white chocolate ganache with whipped cream, pop rocks, cotton candy, a candy necklace and rainbow sprinkles on top! Out of the two milkshakes, I would have to say this one takes the cake! Once again, we couldn’t believe our ears when our hostess told us there was still more coming! 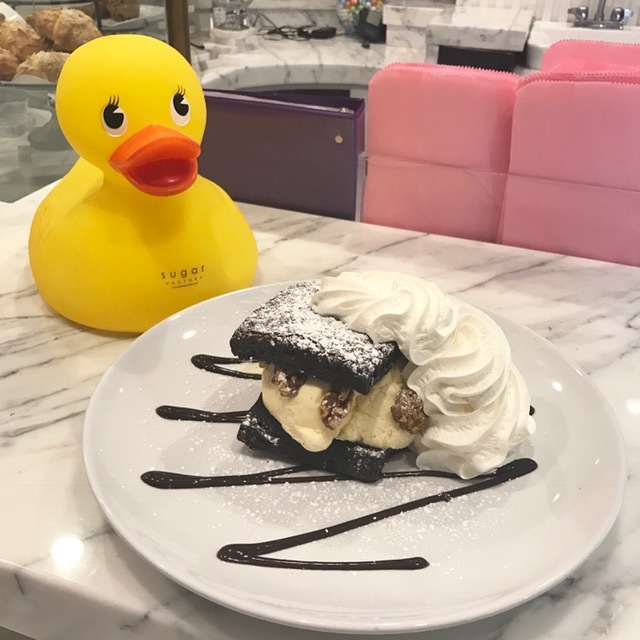 She brought out “The Brownie” ice cream sandwich and “S’mores Crepe”. The brownie was delicious but after eating so much I opted for the lighter of the two and ultimately devoured the “S’mores Crepe”. I will definitely be getting this dessert again. The toasted marshmallows and crushed graham cracker was the perfect end to the meal! 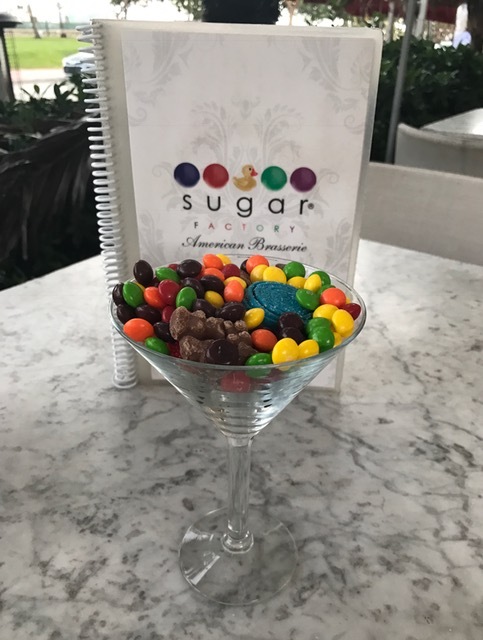 So if you’re not drooling by now or booking your reservation below, I don’t know what else would convince you that the Sugar Factory is AWESOME! The staff along with the beautiful venue, food, desserts and retail store made for such a fun and memorable experience! I can’t wait to return… Until then Miami!